The Environment Ministry on Monday declared Tboung Khmum province’s Ou’Raing Ov district as a model of a clean district after officials inspected its sanitation and environment. Ministry officials had organised a communal clean up drive in the province, where residents joined official to clear dust and garbage along streets, at markets, schools and pagodas, to promote a clean environment. 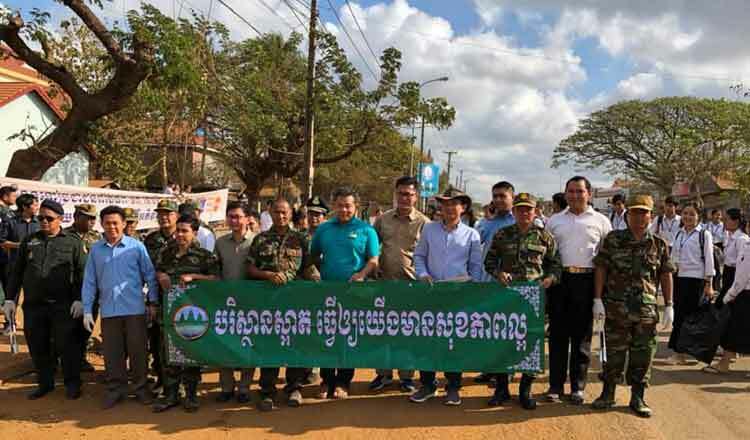 Rath Virak, a ministry undersecretary of state, said that Ou’Raing Ov district was selected as a model district for both its sanitary conditions and good environment. He said that provincial, district and commune authorities want all citizens to enjoy a clean and hygienic environment. Mr Virak noted that previously the ministry provided a rubbish dump, costing about $100,000 in the district. “Having cleanliness and hygiene is possible if everyone joins together,” he said. Nguon Bunnun, district governor, said the joint effort by the district authorities, residents and students to clean up the environment will inspire people to work together to have a clean environment. “Everyone should love the environment by reducing waste and disposing rubbish properly,” he said. The government has declared February 27 as the National Clean City Day to remind people to care for the country’s urban areas. Last year, three provincial cities – Battambang, Kep and Siem Reap – received the Asean clean tourist city award at the Asean Tourism Forum 2018, in Chiang Mai, Thailand. Cambodia had entered seven provincial cities and the capital into the competition – Phnom Penh, Siem Reap, Kampot, Kep, Sihanoukville, Battambang and Kampong Cham.